The life giving energy to most modern gadgets, we have a wide range of batteries, from single use to re-chargable and chargers. Note that if a camera battery has (genuine) beside the title, it is a Genuine factory sourced item and not a clone battery. Charges AA, AAA, or Li-Ion for Digital cameras, plus has a USB port on the side to charge smartphone..
Genuine Canon Battery for EOS 1100D,1300D,1500D/3000D .. Replacement Battery for the EOS 100D, EOS M50, EOS 100 7.2V 875mAH ..
Genuine Canon replacement battery for EOS 750D, 760D, 800D, 77D, 200D and EOS M3, M5,M6 7.2V 1..
Genuine Canon LP-E6 Lithium Battery for EOS 5DsR, 5Ds, 5D IV, 6DII, 7D II, 80D Rated voltage 7.. Replacement Battery for Canon EOS 700D DSLR 7.2V 1120mAh .. Compatibility FUJIFILM X20 / X10 / XF1 FinePix F900EXR / F850EXR / F800EXR / F770EX.. The EN-EL14A Rechargeable Li-Ion Battery from Nikon is a replacement or spare Lithium-ion battery fo.. The 1900mAh Nikon EN-EL15 Lithium-Ion Battery is a rechargeable battery for the Nikon D500, D600, D6.. The EN-EL18a Rechargeable Lithium-Ion Battery from Nikon powers their D4s and D4 DSLR cameras. It ha.. The Nikon EN-EL3e Rechargeable Lithium-Ion Battery provides 7.4V, and can store 1500mAh of power - t..
Genuine Olympus battery for O-MD E-M1 Mk II The BLH-1 is a 1720 mAh lithium ion battery..
Genuine Olympus Battery 1220mAh lithium ion battery. 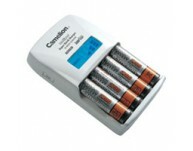 Can be recharged approximately 500 tim..
Genuine Olympus Brand 1210mAh lithium ion battery. Can be recharged approximately 500 times. F..
Genuine Olympus Battery Used in TG-Tracker, TG-5, TG-4 Cameras 3.6V 1350mAh ..
Genuine Sony Battery For DSC-RX100 series DSC-RX1r Capacit..
Genuine Sony Battery For Alpha A7S II, A7R II, A7II Alpha A6000/6300/6500 Alpha A5100 Al..
For Sony Alpha A9, A7R III, A7 III Capacity 7.2V / 16.4Wh (2280mAh) ..